Giuliani was referring to Donald Trump Jr.’s initial statement last year about a meeting he had with a Russian lawyer during the presidential campaign. President Trump personally dictated the first statement his son gave in response to reports of the June 2016 meeting at Trump Tower between Donald Trump Jr., Jared Kushner and Paul Manafort with a Russian lawyer and her associates, senior-level sources told ABC News in 2017. ABC News Chief Anchor George Stephanopoulos interviews Rudy Giuliani on “This Week,” June 3, 2018. The Washington Post was the first to report last July that the president dictated the statement that his son and Russian lawyer Natalia Veselnitskaya “primarily discussed a program about the adoption of Russian children” at the meeting. The statement emphasized that the subject of the meeting was “not a campaign issue at the time,” the Post reported. Trump Jr. later acknowledged that he took the meeting after being told that he would receive damaging information about Hillary Clinton at the meeting. Reports that the president dictated his son’s initial statement were confirmed in a letter the president’s legal team sent to special counsel Robert Mueller. The New York Times obtained and published the Jan. 29 letter on Saturday. Trump’s lawyers write in the letter that the president “dictated a short but accurate response” to The New York Times about the Trump Tower meeting. Previously, the White House has said that Trump neither dictated nor signed off on the statement about the meeting. President Donald Trump attends a meeting with governors and members of Congress on agriculture at the White House in Washington on April 12, 2018. Trump lawyer Jay Sekulow told ABC News in July 2017 that the president had nothing to do with his son’s statement. 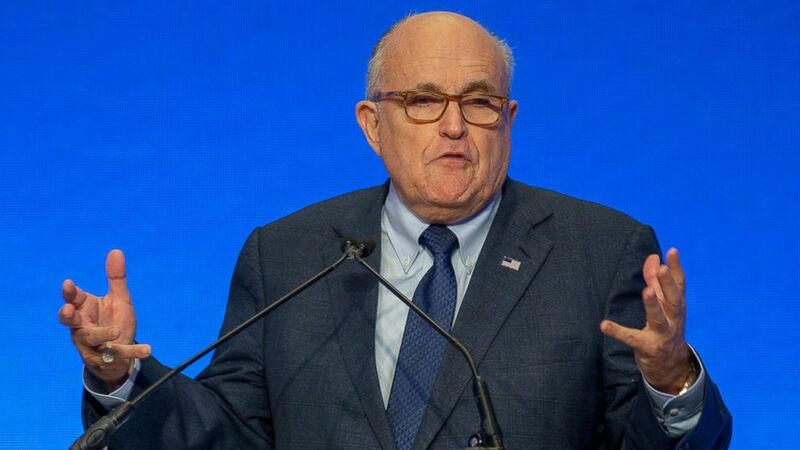 Rudy Giuliani in an interview with ABC News Chief Anchor George Stephanopoulos on “This Week,” June 3, 2018. “If I say something wrong on this show… if you were the FBI, my goodness, I’d — they could prosecute me for the mistake. They’d say of course it was a lie,” Giuliani said.